Once the concrete is poured, the distance to walk across Riverside will be shorter and drivers will have to make slower turns onto 116th around the squared-up corner. This makes me so happy! I wrote a letter to my assembly representative (Daniel O’Donnell) a few years ago, complaining about this corner. So amazing that they’re really doing it. That’s one scary corner. Sad, though, that big slip lanes on Claremont remain. Seems like a big missed opportunity. Thanks DOT and CM Levine. This is a small thing in a gigantic city, but a big thing for people who live near this now much safer corner. PS Gelman, bring back the blue buckets! people coming down the west sidewalk of Claremont were probably crossing there already. The triangle gives them a sidewalk to use. The should eliminate the yellow stripes and use the space to widen the sidewalks. This would also add a wiggle to the drive lane. Yeah, what is the point of that slip lane anyway? Could be a nice bucolic park space. Hah – this is my immediate neighborhood, and I actually went this way on Thursday morning and saw the construction. Honestly, relatively few people make the right turn from RSD here, as 116th is not a through street between Broadway and Amsterdam but is, rather, the main strollway across the Columbia main campus. But every little bit helps. I’ve seen this on a few other intersections in the neighborhood. It also keeps drivers from idling in the crosswalk. I hope this is the standard when doing any construction. My NYC born and raised teenager and I Walked Past on Sunday, He thought it was unfair to Drivers because it made so difficult to turn. 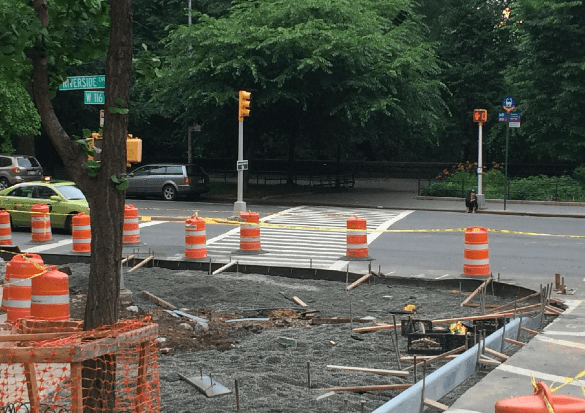 Will Curb Extensions and Signs Do the Job at Broadway and Dyckman?